The Scottish government is spending £255,000 on a plan to put freight onto the Caledonian Canal, which it reckons will take 15,000 lorry trips off the road. The 60 mile Caledonian Canal runs the length of the Great Glen allowing vessels to sail from the west coast via Fort William up to Inverness and the North Sea. A six month pilot scheme aims to transport 7,600 tonnes of timber on the canal as well as 6,000 tonnes of timber from Loch Etive to Corpach. In addition, a mobile floating pier on Loch Etive will be used to transfer 108,000 tonnes of timber by water over the next five years. “Not only will this route further open up Scotland for business, it will also support our aim to reduce greenhouse gas emissions by taking lorries off our roads, and helping to clear congestion on the vital A82 route. Banff & Buchan MSP Stewart Stevenson has welcomed figures which show the availability of Modern Apprenticeships has increased dramatically under the current Scottish Government. During the previous administration, apprenticeship places across Scotland fell by 20% from 20,649 to 16,930 but they have been restored to 20,218 since the SNP took office. Adult apprenticeships fell by just over 4,000 during the previous administration from over 11,000 to 7,359 but have also increased to over 11,000 under the current Scottish Government. In Aberdeenshire, the increase in places is above the average, with a 29% growth in places since 2006/07. There are now 824 apprenticeships available in the area compared to 640 at the end of the previous administration. “I am delighted that the SNP Government is successfully reversing the previous administration’s legacy of neglect when it comes to apprenticeship places. Apprenticeships are more important than ever during these difficult economic times as people seek to retrain and learn new skills. “The situation in Aberdeenshire is well ahead of the national average and is testament to the fact that apprenticeships are clearly important to the fishing and oil & gas industries. Banff & Buchan MSP and Minister for Transport Stewart Stevenson has written to his Westminster counterpart, UK Transport Minister Mike Penning to see if legislation on school bus seatbelts could be transferred to Holyrood. 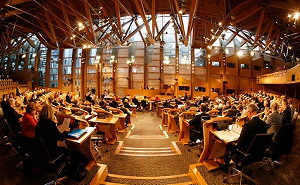 Mr Stevenson was speaking at a meeting of the Scottish Parliament’s Public Petitions Committee. The meeting was also attended by Banffshire campaigner Ron Beaty. Mr Stevenson said the Scottish Government had previously had talks on the issue with the UK Government "without getting any sense that that would be a request which if made would be accepted". However, with the recent change in the UK Government and positive talks with the new Minister, this is something that Mr Stevenson and Schools Minister Keith Brown would work on. "Keith Brown, the Schools Minister, wrote to Mike Penning in June seeking to see what could be done in terms of legislative competence in terms of seatbelts. "I think we`ve subsequently become aware of what has happened in Wales and how that competence has been given there. "I`ve been discussing that this morning with the Minister from the UK Government and I think it is clear that is an area where we can make significant progress in terms of taking forward school bus safety." Banff & Buchan MSP Stewart Stevenson and MP Dr Eilidh Whiteford have given their support to the Lollipop Person of the Year 2010 event sponsored by Kwik Fit Insurance which is to be launched later this month. The event will help to raise awareness of road safety issues and highlight the importance of lollipop people to children and schools. “Lollipop women and men deserve a huge amount of recognition for the work they do in regard to road safety and they are greatly respected and loved by the children that they help and also by their local communities. Their dedication to the children knows no bounds and they should be highly recognised for their efforts. “School pupils can also, as well as casting their vote, explain why they are nominating their Lollipop person which can include drawings, poems, songs and videos. Banff & Buchan MSP Stewart Stevenson has welcomed the latest round of European Fisheries Fund (EFF) grants which see several businesses in Banff & Buchan receive funding to invest in new equipment. The money will help to improve profitability in the industry and secure jobs during a difficult time for the fishing industry. Beneficiaries in Banff & Buchan include £165,790 for Peterhead based Lunar Freezing to add a new processing area within its existing cold store; £52,348 for Fraserburgh based Prime Seafoods to purchase and install a range of equipment; £21,540 for Macduff based Deveron Shellfish and £154,743 for Banff & Buchan College to provide advanced simulation training for fishermen. “These are difficult times for the fishing industry, but I know that this latest funding will be warmly welcomed by those who benefit from it. The industry continues to support a significant number of jobs in Banff & Buchan and the sector is worth over £1 billion annually to Scotland’s economy. “It is essential that the industry is supported in its efforts to grow and improve profitability and I am delighted that this support is being provided. Leading construction firms are set to compete for the contract to deliver traffic flow technology along the M90 in Fife as part of the Forth Replacement Crossing (FRC) scheme. The Fife works will form part of a 14 mile (22 km) ITS corridor that extends from the M9 Junction 1 at Newbridge to the M90 Halbeath Junction. Overhead signal gantries along this corridor will aim to keep traffic moving smoothly by providing traffic, lane control and mandatory speed control and information to drivers via variable message signs (VMS). “The ITS system is an essential part of the FRC proposals and will help manage congestion, improve the reliability of journey times across the Forth and reduce the likelihood and impact of accidents. Additional benefits include the refurbishment of the M90 southbound hard shoulder, enabling it to be used as a bus lane and limiting any impact of traffic queuing on public transport journey times. Transport Scotland received five prequalification submissions following the publication of the Contract Notice on 2 July 2010. The top four submissions were determined following an assessment of each applicant’s financial and technical capabilities. It is intended that these four will enter into competitive dialogue with Transport Scotland in November to discuss their proposals, before submitting a final tender early in 2011. It is anticipated the award of the Fife ITS contract will then be made in May 2011 with construction expected to begin soon after. The new Bathgate Station opened for business today (Monday, October 18) as preparations continue for the launch of the £300m Airdrie-Bathgate Rail Link this December. The first element of the new, Network Rail-built, line to enter service, the station was officially opened by Transport Minister Stewart Stevenson, and offers Bathgate’s rail passengers one of the most modern and accessible travel facilities in Scotland. Today also marks the end of major construction work on the project, with the line now ready for the beginning of driver training ahead of the introduction of regular passenger services on December 12. Constructed by Network Rail and funded by Transport Scotland, the route will allow passengers to travel direct from Helensburgh and Milngavie, in the west, to Bathgate and Edinburgh in the east. “Purpose-built to meet the needs of the modern commuter, the new Bathgate Station will provide the travelling public with some of the best facilities available anywhere in Britain. “Bathgate Station has been at the very heart of the community since the industrial revolution when it supported the local and national economy, to today where it sees over half a million passenger journeys a year. “The Scottish Government is determined to see continued investment which will deliver sustainable economic growth for our communities and businesses, and today’s formal opening of the new Bathgate Station underlines that commitment. Facilities at the new station – which will be operated by ScotRail – include ticket office, waiting shelters, help points, cycle racks, pick up/drop off zone, taxi waiting areas, two bus stops and 400 parking spaces including 20 reserved for Blue Badge holders. "I am delighted to formally accept the handover of the station on behalf of ScotRail and its customers. The Airdrie-Bathgate Rail Link project has seen 15 miles of new track built to connect communities in West Lothian and North Lanarkshire restoring rail services after a gap of 50 years and connecting passengers to the country’s two biggest cities. Bathgate and Drumgelloch stations have also been rebuilt as part of the project, with Livingston North and Uphall having been upgraded and three new purpose-built stations having been constructed in Armadale, Blackridge and Caldercruix. The longest new passenger line in Britain for over a century, the rail link is expected to generate new socio-economic opportunities for those it serves and to help encourage motorists out of their cars, easing traffic on the M8. A £6.5 million dual carriageway scheme on the A75 has opened to traffic, over two months ahead of schedule. The 1.4 mile Cairntop to Barlae scheme will provide improved access to and from the west coast ports, supporting businesses, communities and tourism across south west Scotland and beyond. “This early dual carriageway completion is great news for south west Scotland and the west coast ports. “The A75 is a vital link connecting Cairnryan and Stranraer to the rest of Scotland and this £6.5 million scheme will now provide a dedicated overtaking opportunity, helping traffic flow and meaning quicker, safer journeys for the thousands of tourists, freight and local motorists who use this route each day. “I am delighted to see this project completed so quickly, allowing these benefits to be realised much sooner than scheduled. This scheme also supports plans to relocate Stena’s port to Cairnryan, further enhancing these connections. “We are delighted to see that Cairntop to Barlae scheme has now opened and ahead of schedule too. “The A75 is a vital part of South West Scotland’s road infrastructure and will play a key role in helping to maximise the benefit of Stena Line’s new Loch Ryan Port opening in Autumn 2011. The contract was awarded in December last year and was originally scheduled to last 12 months. The road has therefore opened 10 weeks ahead of schedule. The project, which was undertaken by RJ McLeod, has seen a new eastbound carriageway constructed on the site of a disused railway line, with the existing A75 becoming the new westbound route, giving both east and westbound dedicated safer overtaking opportunities. Following the announcement by Grampian NHS of a review of maternity services across the region, Banff & Buchan MSP Stewart Stevenson is urging people across the constituency to take part. “Reviews and consultations will be occurring across a whole range of critical frontline services as public authorities try to get to grips with the major budget cuts coming from Westminster. It is extremely important that the views, experiences and comments of the people of Banff & Buchan are heard. “Banff & Buchan has a history of strong support for Maternity Services, most notably with the successful campaign in Fraserburgh during 2006/2007 to retain maternity services at the town’s hospital. That hard fought campaign will undoubtedly be a spur to get responses in for the current review. 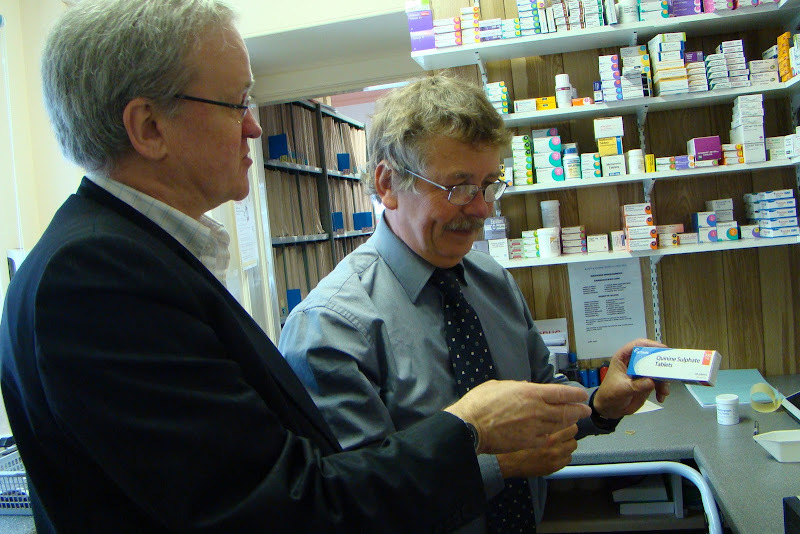 Banff & Buchan MSP Stewart Stevenson paid a visit to a rural medical practice this week. For the past couple of years, the British Medical Association (Scotland) has offered MSPs the opportunity to spend some time in a local GP practice in their constituency during the summer recess. After receiving extremely positive feedback from both MSPs and the GP practices involved, the BMA repeated the scheme this year. The purpose of the visit is for MSPs to see first-hand the work of GP surgeries and to discuss the challenges and opportunities currently being faced by GPs and their teams both at a local and at a national level. 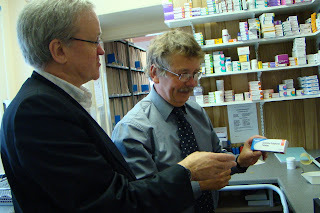 Dr MacRae at the Gamrie Medical Practice in Gardenstown kindly hosted the visit from Mr Stevenson – which included a mini health-check for the MSP! “This was an excellent opportunity to see the front line of our NHS. “It is clear to me that the commitment of GPs to meeting the needs of rural patients is high. Despite the ever increasing call on our GPs’ time, practices such as the one at Gamrie are extremely effective at meeting the needs of patients in their own communities. “On a lighter note, it confirmed that despite a heavy workload, my blood pressure is still under control! Banff & Buchan MSP Stewart Stevenson has welcomed the latest announcement by Awards for All, which sees three schools and three local organisations obtaining substantial awards totalling more than £40,000. Awards For All provide grants to those involved in art, sport, heritage and community activities, and projects that promote education, the environment and health in the local community. Gardenstown Playschool (£4,113), Clerkhill School (£10,000) and Stuartfield School (£9530) will each receive substantial awards with some of the purchases including; an interactive white board and laptop and improvements and additions for the playgrounds. Pitsligo Parish Church of Scotland's grant of £1,000 will enable the purchase of new stacking chairs, providing better facilities for the local community. Aberdeenshire Council - Community Learning and Development's grant of £10,000 will contribute towards artist fees, set/props/costumes and fireworks, accommodation and workshop space, mentoring and training to help support young people in a range of theatre and performance skills. Finally, Buchan IT and E-learning Service's grant of £7,000 will aid their pilot project to promote IT and Elearning for the older residents in sheltered housing complexes in the Central Buchan area of Aberdeenshire. "I'm delighted for the schools concerned as the awards are a substantial sum which will be put to good use. "For the three local organisations that have been successful, I applaud their determination to secure funding and I trust that the users of the organisations will reap the benefits. Banff & Buchan MSP Stewart Stevenson has welcomed the latest announcement by the Big Lottery Fund, which sees Banff Rock Challenge Group obtaining the award of £1,960 from the 2014 Communities Programme. “It is great news to learn that Banff Rock Challenge Group has achieved this much sought after funding which can go a long way in securing their future. “I know that this particular award will allow the group to purchase costumes and design a performance at the Global Rock Challenge in Aberdeen in February 2011, for which I wish them the best of luck. “Once again, my congratulations go to Banff Rock Challenge Group on such welcoming news. Banff & Buchan MSP Stewart Stevenson has encouraged his constituents to enter the ‘see me’ national creative writing competition which has three categories: Short story, poetry or a tweet and it is open to anyone living in Scotland who is interested in writing. “I would urge any interested constituents to get their thinking caps on and give this a go by stating what support means to you. This, by doing so, can help to inspire others. “The theme of ‘Support’ is open to your own interpretation. Support is given and received by us all from family, friends, neighbours, teachers and colleagues in our everyday lives and I’m sure we can all recall an experience when support given has been crucial. “Entrants should draw from their personal experiences or use their imagination for the competition and can enter their piece in one of the three categories of either a short story (max 1,500 words), a poem (max 500 words) or a tweet submitted via Twitter (max 140 characters). Banff & Buchan MSP Stewart Stevenson has welcomed the publication of new figures which show how hospital acquired infections (HAIs) have fallen since the election of the SNP Government. Banff & Buchan MSP Stewart Stevenson has hailed the work of a group examining how Carbon Capture and Storage (CCS) schemes in Scotland should be managed and coordinated. As a result of the efforts of Scotland’s Regulatory Review Group, Scotland is now better placed to process planning applications for CCS facilities and give power companies a clear idea of the regulations they must adhere to. The work will now be taken forward by a new Project Monitoring Board to help monitor progress of CCS demonstration project applications, promote effective engagement with communities and meet the demanding timescales required under the UK and EU CCS funding competitions. Peterhead power station recently revived plans to explore the possibility of developing a carbon capture test plant at the site after previous plans were shelved due to a lack of UK Government support in 2007. “This work is a welcome step forward for the future of Carbon Capture and Storage in Scotland and as such is important for Peterhead power station. “If power companies want to build Carbon Capture facilities then it is vital that there is a robust and responsive regulatory system in place that will enable them to do so. By examining how planning applications for such projects can best be managed, the work of this group is helping to prepare Scotland to realise the vast potential of CCS schemes. “As well as bringing Scotland closer to meeting our world leading climate change targets, a successful Carbon Capture project at Peterhead will bring with it important economic benefits for the area. A reception was held at Dynamic Earth last night to mark completion of the project, which saw Caledonian Maritime Assets Limited (CMAL) collaborate with the Department for Regional Development in Northern Ireland and the Department of Community, Equality and Gaeltacht Affairs, to examine ideas for a common design and procurement strategy for small ferries. With many of the vessels in service approaching or exceeding their target replacement of 25 years, the issue of maintaining and procuring new vessels and improving harbour infrastructure is key to ensuring that communities have access to lifeline ferry services which are reliable, convenient and affordable. To ensure the continued provision of quality services, the partners have developed a Strategic Plan to help influence policy makers in the procurement of replacement ferry vessels, as part of their respective Governments’ policy commitments to supporting remote island communities. The plan outlines a proposal for the development of a common vessel design and a cross-border collaborative approach to procuring replacement ferries, to deliver new vessels and associated improvements in harbour infrastructure. This approach would ensure cost savings in vessel procurement, allow shared expertise in researching new technologies and innovative funding mechanisms and flexibility in operation and maintenance of the fleet. The report identifies a number of options for procurement models to look at the most cost effective and efficient approach, including joint procurement and the appointment of CMAL as the lead authority for all procurement. Eight routes were examined during the course of the project. However, it is anticipated that the project’s findings could potentially have wider reach and benefit for other routes in the three regions. “We are delighted to have been involved in the Small Ferries Project, working with our partners to develop a plan which we hope will help to ensure the provision of quality ferry services in Scotland, Northern Ireland and Ireland. “The partners in the Small Ferries Project are to be commended for their collaborative cross-border approach in developing this plan which aims to improve and enhance ferry services for remote and island communities in Scotland and Ireland. The Small Ferries Project was part financed by the European Union’s Regional Development Fund through the INTERREG IVA Cross-border Programme, managed by the Special EU Programmes Body.